Usually we eat ice cream only in the summer. 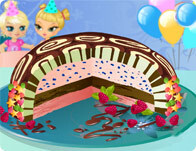 Well, in case you want a delicious ice cream cake now, just prepare it and satisfy your hunger. Design your own custom tasty treat and eat it before it melts.